Dea Loher¹s narrative focuses on existential matters. It investigates the meaning of life in the face of a completely meaningless death, finding images of great intensity. No other German-speaking dramatist is so widely read, in her own country and all over the world, and more successfully staged (more than 300 productions, translations in 31 countries) than Dea Loher. 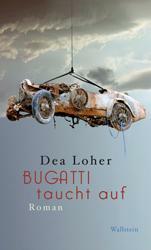 After her highly acclaimed volume of short stories »Dog¹s Head« (Wallstein, 2005), she now presents her first novel. She connects two circles of events with one another, each of them based on real occurrences: a young man is beaten up, kicked and murdered by a group of young people at the Shrovetide carnival in Locarno in 2008. The more attempts are made to reconstruct the crime from the puzzle of testimonies, the more enigmatic and blurred the picture of the incident becomes, making it more and more difficult to establish what really happened (and why). In spite of the clear body of evidence, finding the guilty party is more of a problem than expected; the best that can be hoped for is partial atonement for the deed. A friend of the victim¹s family tries another approach: he remembers the wreck of a car that has lain at the bottom of the Lago Maggiore for 75 years: a Bugatti Brescia 22. At least, that is what people say. Up until now, all attempts to recover it have remained fruitless. And now the prospect of diving to the depths of these abysses, and of our own, becomes an adventure with an uncertain outcome. "A gifted story-teller who takes great pleasure in creating eccentric characters and situations that have spiralled out of control"
Dea Loher, born in Traunstein in 1964, studied German and Philosophy in Munich. She lives in Berlin. Her plays have won many prizes, including the Dramatist Prize awarded by the Hamburg Volksbühne, the Jakob Michael Lenz Prize, the Gerrit Engelke Prize, the Muhlheimer Dramatist Prize (twice), the Else Laske-Schüler Dramatist Prize, the Bertolt Brecht Prize and the Berlin Literature Prize in 2009 and the Marieluise-Fleißer Prize in 2009.